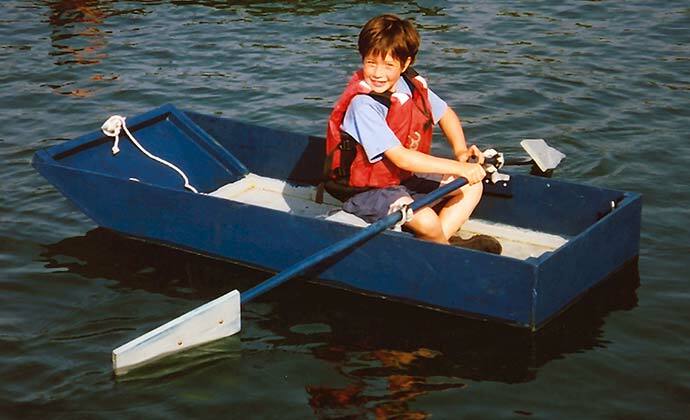 Seven-year-old Jamie Lowrey had the idea of building this boat from a single sheet of spare plywood. He and his father made scale models from shirt cardboard and built a full-size model from cardboard boxes in the living room of their Manhattan apartment. Jamie and Charlie built the boat on Fiddlehead Island, Maine and launched her in August 2002. They used every bit of the plywood sheet, and cut a lobster buoy in half to use as flotation. EAGLE is 6'3" long with a beam of 2'6". Contact the Lowreys at charles.lowrey@prudential.com.